ghalfacree wrote: The new BCM2837 system-on-chip gets far, far hotter than its predecessors. 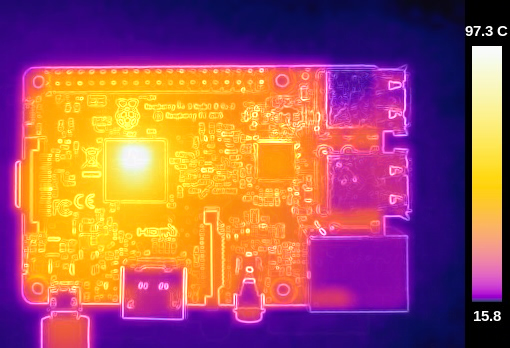 This image was taken using a calibrated Flir thermal camera while the Pi 3 had been at 100% CPU load - but no GPU load - for five minutes, and registered nearly 100°C (212°F). I confirmed the temperature with a K-type contact probe, and also by poking the chip. Don't poke the chip. It hurts. Oh, and don't trust the built-in thermal sensor: when that picture was taken, the internal sensor was happily reporting sub-80°C (176°C) temperatures. I already assumed the pi3 would get more hot then the pi2 so i ordered 2 nice heatsinks at the pihut.
" sub-80°C (176°C) " I guess you meant 176 F ? Very interesting measurements. The hot-spot looks quite off-center in the SOC package, is that the entire outline of the die, or could it be that the thermal sensor internal to the chip is located too far away from the hottest part of the chip? Or simply miscalibrated. It's a quote from Gareth Halfacree (ghalfacree), author of the official raspberry pi user guide, not me. He's currently answering questions and posting results of various thermal tests on the Pi 3 in the reddit thread linked above, at this moment. Wow, I want an official colding accessory. This day finally comes, resellers could sell heat sinks confidentally. allfox wrote: This day finally comes, reseller could sell heat sinks confidentally. They always could to anyone running a heavily overclocked PiB or Pi2B in a confined space and making extensive use of the GPU. Agreed~ But maybe with Pi 3, everyone would need a colding solution.It would be ready to boil coffee in 5 min. Edited: This joke is bad, as it makes people think something would go wrong at 100 C. I did think so, however follow threads from moderators explained that there is nothing hazard. It's hot, but that's all of it. I don't like colding fans, they are noisy. Last edited by allfox on Wed Mar 02, 2016 12:52 pm, edited 1 time in total. Oh well, at least us Pi heatsink pioneers are here to recommend the best ones for the job. The official advice is that "you may need a heatsink" for the Pi3, especially in a closed environment running intensive code. rurwin wrote: The official advice is that "you may need a heatsink" for the Pi3, especially in a closed environment running intensive code. So, for normal use by normal users, do I need a heat sink? The temperature sensing is part of the VC4 GPU. Now that the ARMv8 is a bigger part of the die, I guess it is not surprising that it can become the hot spot. If Pi3 may require a heatsink, then how does that work with HATs? Will there be cases and standoff kits to allow a HAT to rise above a heatsink? You might get some benefit from a "heat spreader", which doesn't have fins that stick up but just (for example) a flat metal block that contacts the SoC and still spreads out the heat over a larger surface area. If you can attach it without putting too much mechanical stress on the SoC or other parts. jojopi wrote: If Pi3 may require a heatsink, then how does that work with HATs? Will there be cases and standoff kits to allow a HAT to rise above a heatsink? I have an expansion board on the GPIO header (not officially a HAT, but effectively the same), and this just clears a heatsink measuring 10mm in height. Unless a HAT had components mounted on the underside, it wouldn't foul on a heatsink of this height, although a layer of insulating material between the two would be a good idea incase the HAT is physically leaned on and pushed onto the heatsink causing sparks to fly. However, many heatsinks are much shallower than 10mm in height, so should give the additional clearance needed to avert causing a disastrous short circuit. I guess we'll need to wait for official feedback on whether the HAT specifications define a maximum protrusion distance for components on the underside of a HAT to have a definitive answer though. Whatever you do, don't panic. I'm sure the RPF will be on top of this very soon. Does the Pi3's internal temperature sensor (living in the Videocore I read in this thread) always report 20° C too little? Or "only" when the ARM is hot? Which looks reasonable to me (layman). If we added +20° C to this value, the resulting 64° C would sound too much for a Pi3 running in more or less idle mode, isn't it? So would a heat-sink be advisable when I want to use a Pi3 regularly within our family's Blender network to ray-trace? Meaning the Pi3 doesn't run with a full load all day, but several times a day all the Pi3's cores would be used for 30-60 minutes with full-load. These little Aukru heatsinks have a "double-sided (adhesive) tape" on their bottom. So the free side of this tape is ready to be stripped and then the heatsink could be pasted on the Pi3's ARM/RAM chip. But, does such a double-sided tape pass on enough heat from the chip to the heatsink? Or is a heat paste a must in such cases? I have always gone with something like this for pi2's that are overclocked and in super hot environments (40+c ambient temps in summer), should help a bit and they fit nicely under the hats that i have seen. If you have a very enclosed case, such as thePiBow, you may want to consider it. Especially if you are running video or 3D graphics or if the CPU load is high for an extended period. I'll probably drill some ventilation holes in my Pibow Coupe when I get around to it. The Pi will start to throttle-back when the temperature sensor reaches 85C, so you will want to avoid getting too close to that figure simply to maintain performance. However there is not going to be any significant danger to the SoC running at that sort of temperature or even consideraby hotter than that. Testing has been done at well over 100C without obvious damage although that may deminish the longevity of the chip and it could give you a nasty burn if you were to touch it. I wouldn't worry about the placement of the sensor making the CPU temperature inaccurate. Those 20 degrees C are not going to damage anything. ghalfacree wrote: I confirmed the temperature with a K-type contact probe, and also by poking the chip. It always makes me nervous when I see CPU temps hitting ~80°C on any platform, but I'm not too worried about having to use a heatsink. Last edited by blc on Wed Mar 02, 2016 10:43 am, edited 1 time in total. Since I am a complete hardware layman, does somebody know if I can use the spare heat-sink which came with my Pi2 case: Aukru transparent Case with 3x Aluminum Heatsink for the Pi3 now? Btw, the Pi3 now lives in this case. Ray tracing is very compute intensive, so I would suggest a heatsink. Use the one you have, it should be fine. The tape *should* transfer the heat. It shouldn't - the chips are tested to very high temperatures in an oven to 125C. There seems to be an inconsistancy somewhere. Gareth Halfacree's findings indicate the Pi's internal sensor reporting < 80C when it's actually at almost 100C, well past the auto-throttling stage and into the 'will possibly damage the chip' range. When the Pi thinks it has reached 85C, it's actually already at 110C or possible 120C+. The RPF should provide a heat sink with the pi3 or at least sell a good quality one separately. chrisoh wrote: There seems to be an inconsistancy somewhere. Gareth Halfacree's findings indicate the Pi's internal sensor reporting < 80C when it's actually at almost 100C, well past the auto-throttling stage and into the 'will possibly damage the chip' range. When the Pi thinks it has reached 85C, it's actually already at 110C or possible 120C+. Read it again. He found a temperature differential of 17C. If the sensor is reading 85C then the camera may see 102C. Where have you read that 100C will possibly damage the chip? ric96 wrote: The RPF should provide a heat sink with the pi3 or at least sell a good quality one separately. The RPF do not sell Pi's. It's not a bad idea for them or the distributors to sell heatsinks though. I'm not using one, seems fine to me. Why increase the cost for everyone by including it?